Following a 52-min firing of its powerful engine this morning, ESA’s ExoMars Trace Gas Orbiter is on track to arrive at the Red Planet in October. The initial analysis by the flight dynamics experts showed a tiny 0.01% underperformance against the planned ‘delta-v’ of 326.497 m/second. The event marked the completion of deep space manoeuvre 1 (DSM-1), which will be followed by DSM-2 (much smaller) on 11 August. The burn got underway as planned at 11:30 CEST and ran for 52 minutes. 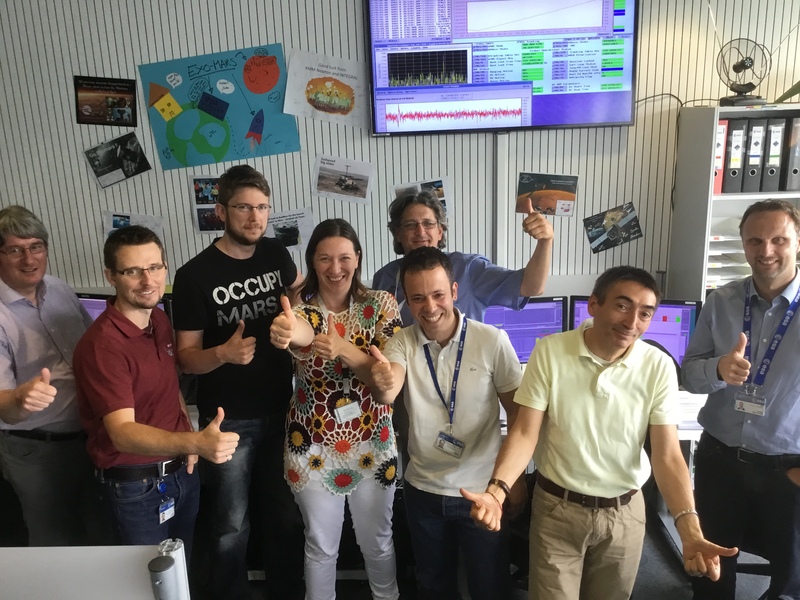 Progress today was followed closely at ESOC by the ExoMars team, who had been working for several days to ensure everything was ready on board. As you can see in the photo, they were rather pleased! I think there is a typo when saying there will be a second manoeuvre on 11 August. It’s also called DSM-1?